لخدمة أھداف وتوجھات النظام السیاسي القائم"
Thank you, Mr. Chairman, for conducting this important hearing on the situation faced by Coptic Christian community in Egypt, and for inviting me to testify. As you know, this is a time of substantial transition in Egypt as Egyptians strive to move their country towards democracy. This is not an easy process and it will not happen overnight. Egypt is only starting on a path from the temporary stewardship of the Supreme Council of the Armed Forces (SCAF), through parliamentary elections that will begin in two weeks, then the process of drafting of a new constitution and finally presidential elections. As they move toward these milestones, millions of Egyptians hope to see the emergence of a democratic civilian government that respects the universal rights of all of its citizens. تعد أحداث ماسبيرو يوم الأحد الموافق التاسع من أكتوبر 2011، والتي فقدت فيها مصر 28 شهيدا منهم 26 من المواطنين المسيحيين و 1 من العسكريين، و1 من المواطنين المسلمين ، بالإضافة لأكثر من 321 مصاب من المدنيين والعسكريين، وفقا لبيانات وزارة الصحة والسكان، تعد نقطة تحول فارقة هددت أحد أهم مقومات المجتمع المصري وأسباب تفرده. وكان للمخزون الحضاري للشعب المصري والذي رفضت جموعه محاولات التحريض والاستعداء ضد المواطنين المسيحيين، دورا حاسما في حماية الوطن ووحدة شعبه من كارثة قومية محققة. فقد شهد هذا اليوم عددا من الانتهاكات الجسيمة لحقوق الإنسان تشكل جرائم ارتكبت في حق المتظاهرين السلميين، شملت جرائم قتل عمد، وقتل عشوائي، والاعتداءات البدنية وما تخلف عنها من إصابات جسيمة أسفر بعضها عن إعاقة تامة أو جزئية وإصابات أخرى متفرقة. كما وقعت جرائم إتلاف لمركبات ومهمات عسكرية وممتلكات عامة وخاصة. ويوجز هذا التقرير نتائج لجنة تقصي الحقائق التي شكلها المجلس القومي لحقوق الإنسان من بين أعضائه، بموجب قرار صدر فى جلسته الطارئة بتاريخ 10 أكتوبر 2011، برئاسة الأستاذة "منى ذو الفقار" وعضوية السيدات والسادة د. "أسامة الغزالي حرب"، ود. "اسكندر غطاس" ،و"إنعام محمد على" ، و "جورج اسحق" ، و"حافظ أبو سعدة"، ود. "درية شرف الدين"، ود. "سمير مرقس"، "عمرو الشوبكى"، ود. "عمرو حمزاوى"، ود. "فؤاد رياض، و"محسن عوض"، "و"ناصر أمين"، و"يوسف القعيد"، أعضاء المجلس. وساعد فى إعداد التقرير عدد من الباحثين المتخصصين من مكتب الشكاوى بالمجلس يضم السيدات والسادة جمال بركات، نبيل شلبى، إسلام شقوير، أحمد عبدالله، كريم شلبى، خالد معروف، أسامة نشأت، أحمد جميل، أسماء شهاب، نشوى بهاء، ومن أمانة المجلس الزملاء أمجد فتحى، مى نجيب، رشا علوى، أسماء الشهاوى، هانى الحسينى، أسماء فوزى، معتز فادى، محمد ماهر، رامى علام، عمرو يسرى، خالد معتصم، رامى ميخائيل . At least 41 people were killed and hundreds were injured in Cairo yesterday when Egyptian police and armed forces fired tear gas and live ammunition at a peaceful march protesting the destruction of a Coptic church in Mari Nab, Aswan. The Cairo protest was supported by members of the Muslim community, and was part of series of simultaneous demonstrations that occurred in Alexandria, Luxor, Qena, Minya and Beni Suef. In addition to drawing attention to the attack on the church in Aswan, the demonstrators were also requesting an effective conclusion to investigations into a spate of sectarian attacks, and the passing of a new law governing the building of churches, which may serve to limit the frequency of these attacks. Report on Marriage, Divorce and Religious Courts Published A report on religious courts and tribunals in the UK has just been published by researchers at Cardiff Law School and the Centre for the Study of Islam in the UK at Cardiff University. The year-long project, funded by the AHRC/ESRC Religion and Society Programme, explored how religious law already functions alongside civil law in the area of marriage and divorce. The research project addressed concerns which were raised in the aftermath of the Archbishop of Canterbury’s lecture on Religious and Civil Law in 2008, which provoked an animated debate concerning the extent to which English law should accommodate religious legal systems, such as Sharia law. 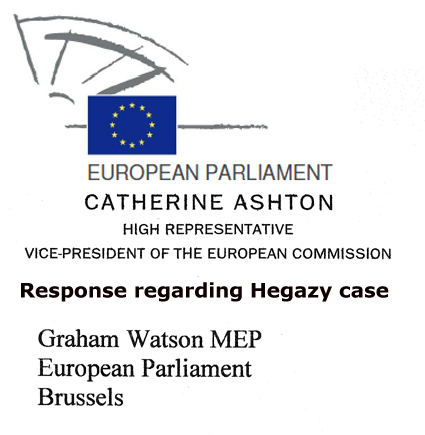 These concerns have also come to the fore more recently as a result of the Arbitration and Mediation Services (Equality) Bill (HL Bill 72) introduced into the House of Lords by Baroness Cox which seeks to regulate the operation of religious courts. 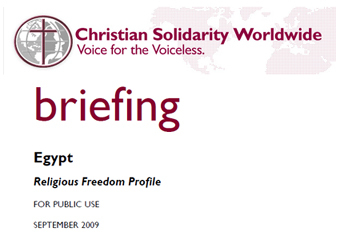 FINDINGS: The Egyptian government engaged in and tolerated religious freedom violations before and after President Hosni Mubarak stepped down on February 11, 2011. 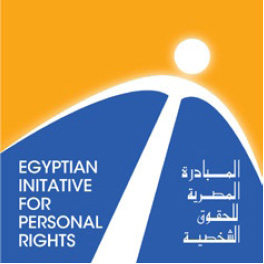 Serious problems of discrimination, intolerance, and other human rights violations against members of religious minorities, as well as disfavored Muslims, remain widespread in Egypt. Violence targeting Coptic Orthodox Christians remained high during the reporting period. This high level of violence and the failure to convict those responsible – including two of the three alleged perpetrators in the 2010 Naga Hammadi attack – continued to foster a climate of impunity, making further violence more likely. The Egyptian government has failed to protect religious minorities, particularly Coptic Christians, from violent attacks, including during the transitional period when minority communities are increasingly vulnerable. Since February 11, military and security forces reportedly have used excessive force and live ammunition targeting Christian places of worship and Christian demonstrators. The constitution provides for freedom of belief and the practice of religious rites, although the government places restrictions on these rights in practice. Islam is the official state religion, and the principles of Shari'a (Islamic law) are the primary sources of legislation. The status of respect for religious freedom by the government remained poor, unchanged from the previous year. Members of non-Muslim religious minorities officially recognized by the government generally worship without harassment; however, Christians and members of the Baha'i Faith, which the government does not recognize, face personal and collective discrimination, especially in government employment and their ability to build, renovate, and repair places of worship. FINDINGS: Serious problems of discrimination, intolerance, and other human rights violations against members of religious minorities, as well as disfavored Muslims, remain widespread in Egypt. The reporting period marked a significant upsurge in violence targeting Coptic Orthodox Christians. 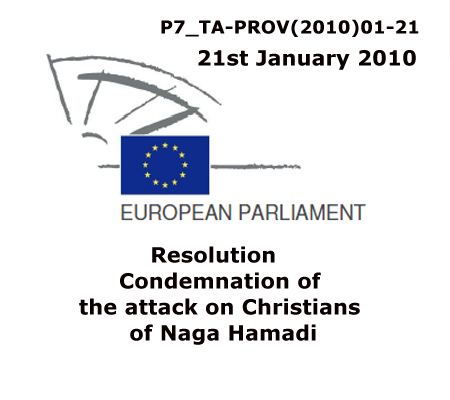 The Egyptian government has not taken sufficient steps to halt the repression of and discrimination against Christians and other religious believers, or, in many cases, to punish those responsible for violence or other severe violations of religious freedom. EIPR Report Two years of sectarian violence "Arabic"